The court of appeal in North Louisiana has been served by distinguished judges since intermediate appellate courts were first created by the 1879 constitution. From each bench of the Louisiana appellate courts have come governors, law teachers, federal judges, justices of the Louisiana Supreme Court and holders of other prominent professional, public and private positions. The Second Circuit Court of Appeal in Shreveport now consists of nine judges who are elected from three election districts in the 20 northernmost parishes of Louisiana. The most senior in service appellate jurist serves the court as chief judge. Three judges are elected from each election district. Eight parishes are contained in Election District One: Ouachita, Morehouse, Richland, Franklin, East Carroll, West Carroll, Madison and Tensas. Election District Two contains the nine parishes between Shreveport and Monroe: Bossier, Webster, Claiborne, Bienville, Union, Lincoln, Jackson, Caldwell and Winn. The parishes of Caddo, DeSoto and Red River are in the Third Election District. Election Districts One and Three contain a sub-district. The 1879 Louisiana constitution established five courts of appeal with two judges each, to hear civil appeals only, the first and second circuits of which were in the northernmost 24 parishes. Fourteen northwestern parishes were in the First Circuit. 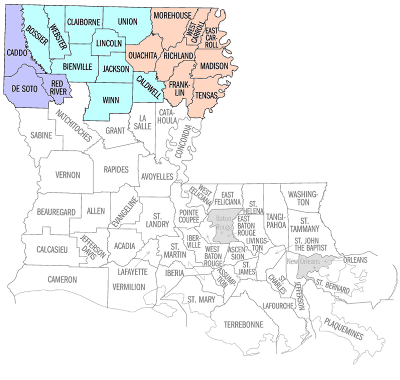 The Second Circuit contained 10 northeastern parishes. Each court was then required to sit in each parish of its circuit. The 1898 Constitution directed that appellate judgeships be phased out as the term of each incumbent judge expired between 1900 and 1904. A 1906 amendment to the 1898 Constitution reestablished and restructured the five original circuits into three civil courts of appeal [1st and 2d Circuits and Orleans], each of which was served by three appellate judges elected in a separate election district. Seven parishes around New Orleans were placed in the Orleans Court of Appeal. The remaining 57 parishes of the state were divided into two circuits with the northernmost 28 parishes being designated as the Court of Appeal, Second Circuit. 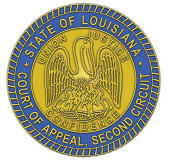 In 1960, the eight southernmost parishes of the second circuit were joined with other parishes of the First Circuit to create the Third Circuit Court of Appeal. Additional appellate judgeships were later added and the Fourth and Fifth Circuits were created out of the three original circuits as the civil caseload increased in the twentieth century and when the jurisdiction of criminal appeals, except where capital punishment was imposed, was transferred in 1982 to the appellate circuits. A fourth judgeship (at-large) was added to the second circuit in 1960. The court gained its fifth judgeship (at-large) in 1968. The sixth and seventh judgeships were created for the court in 1982 with the transfer of criminal jurisdiction. The eighth and ninth judgeships were later created as the caseload grew, being filled by elections in the 1990's, as the at-large judgeships were phased out. As the number of judges on the second circuit reached any multiple of three, statutes have required the successor of a judge in an at-large judgeship to be elected from the second election district of the circuit. A judge is now elected in each of three divisions in each of the three election districts.